Today my task was to install Ubuntu as second system on my Mac Mini. YUMI which I found in the official Ubuntu manual. Now I’m going to install Robot Framework plugin for PyCharm. I’m still using PyCharm version 3.4, so I had to download an archive with 0.10.2 version supported by my PyCharm. Not too technical, but still… For a long time I was playing with some Android development, but it was always just for fun and never left the local computer or my own phone. Now I’ve finally finished a tiny silly but cute app and started uploading it to the Play Store. What can I say – it’s like a new love to programming. Coding starts matter, you again care about all tiny details your app has. You have to groom it before showing to public and you feel it’s your child. So definitely, if you’re tired of programming – try making some software for people. The one-liner above runs the specified script/command until it exits with a non-zero exit code. Moving to a new VPS provider from YourLastHost. Well, I didn’t try their «normal» VPS plans, but $12/year low-end plan was tremendously slow even when using a console and in loading the simplest pages. But hey, it was so cheap! I love to document code and I use PyCharm for Python development. And I always forget the syntax of method arguments type/description. I think the tutorial in the link above is quite explanatory, but I’ll update this post in case I find something new. This will let you easily transfer the application to the mobile device without necessity to compile the application on host computer and transfer the .apk file (in case of Android device). Install the PhoneGap Desktop application as described here. Download the installer and run it. Prerequisite is node.js. Download it and install. I will use the latest version, but LTS is always safer. Note, that on different versions of Windows node.js behaves differently. On Windows8 I recall I got a separate console for Node.js. On Windows7 it can be run from a normal Windows console (type cmd in the command search). From now on we can use phonegap command from the command line. I will download Android Studio: http://developer.android.com/sdk/index.html and call SDK Manager from the toolbar. I store my code on Github, so I’ll need Git. Download the installer here and run it. 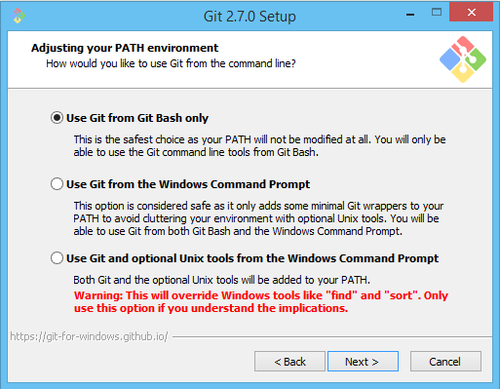 I just have installed git under Windows and what I want to say: this was probably the most perfect program installer I’ve ever seen. Usually I have to check if the program didn’t check unnecessary checkboxes and whether it doesn’t try to install some additional crapware. In best cases you just click through without modifying checkboxes. In case of git I even had to decrease the ‘safety level’ of some options. I just see that this was made with love to users and that creators really thought what people need from their program and how they’re going to use it. Just in case, I suspect I’ll have to play with writing less stuff to SD card. Okay, ladies and gentlemen, today I’m working on the proof of concept (PoC) of a mobile application that has to work with Bluetooth. Normally for a simple project I’d choose Adobe Build to build the project for me. It can automatically build packages for all mobile platforms for you and even do more like publishing your project in corresponding app markets. [Error: Failed to find 'ANDROID_HOME' environment variable. Try setting setting it manually. So, failed to find ‘android’ command in your ‘PATH’. To fix that we need an Android SDK; we’ll get it from Android website. And finally run source ~/.bashrc to initialize those variables. So I wanted to fix the template I use for alembic revisions, and I always forget where to search for it. The template is in script.py.mako file in your alembic directory. For example, my alembic.ini is in db folder, and my script.py.mako file is located in db/migration. This picture Amazon showed me on some IT website today. 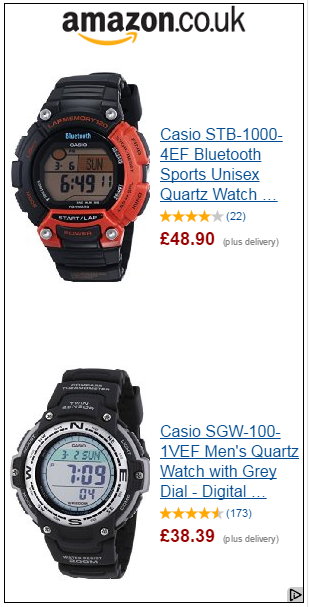 First watches here is what I’ve searched for just yesterday on European Amazon, the second one is what I bought from American Amazon five years ago. So, Internet remembers everything. Feels a bit scary when it’s related personally to you. Your past and your future in one picture built by a computer.